Group 3. Terriers. Section 4. Toy terriers. Without working trial. At the beginning of the 20th century the English Toy Terrier was one of the most popular decorative dogs in Russia. However, the socialist revolution and totalitarian regime established later caused the extinction of almost the whole breed. Only in the mid-fifties when Stalin’s regime had collapsed, an opportunity for restoration of the breed emerged. At the beginning of breeding practically no dogs had a pedigree; many of them were not of pure breed. In the context of the political situation of that time, Russian dog-breeders believed they were not supposed to follow the standards adopted in other countries. Therefore, they established their own standards for many breeds. Standards established for Toy Terrier significantly differed from the English Toy Terrier`s standard in many aspects. From this moment the evolution of the breed in Russia went its own way. On the 12 of October in 1958 two smooth-haired dogs, one of which had a slightly longer hair, gave life to a male dog with a spectacular fringe on ears and limbs. It was decided to keep this feature on. The male was mated with a female dog which also had a slightly long hair. So the longhaired variant of the toy terrier appeared. It was called Moscow Longhaired Toy Terrier. A dog breeder from Moscow Yevgueniya Fominichna Zharova played an important role in creation of this breed variant. 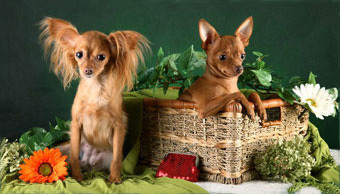 The long isolated evolution and specific selection process have resulted in the creation of a new breed – the Russian Toy Terrier of two types: longhaired and smooth-haired. A small-size elegant dog, lively, long-legged, with delicate bone and lean muscles; males and females do not differ much morphologically, however, their behaviour differs significantly. The ratio from length to height shall make his build appear as square as possible; the height at elbows is slightly longer than a half of the height at withers; the chest is deep enough; the size of the head in relation to the size of the body is small. Lively, very cheerful, not cowardly or aggressive. Skull: Quite high but not too wide (width at the level of cheek-bones does not exceed the scull height). Nose: Small, black or matches with the dog’s colour. Muzzle: Lean and pointed, slightly shorter than the scull. Lips: Thin, lean and tight. Jaws/Teeth: Small, white. Scissor bite. Eyes: Quite big, rounded, a bit prominent, set well apart and straight, dark. Eyelids are dark or matching with the colour, tight-fitting. Ears: Big, thin, set high, upstanding. Long, lean, set high, slightly curved. Topline: Gradually descends from the withers to the tail base. Croup: The croup is somewhat roundish and slightly sloping. Chest: The chest is quite deep, not too wide, oval-shaped. Underline and belly: Tucked up belly and drawn-up flanks, forming a nicely curved line from the chest to the flankes. Shortly docked (two or three vertebras are only left), curried high. The natural tail is also allowed. Thin and lean; seen from the front, the front legs are straight and parallel. Shoulders: The shoulder blades are long and not very sloping. Upper arm: Forming an angle of 105 degrees to the shoulder blade. The length of upper arm is practically the same as the length of shoulder. Forefeet: Small, oval, well-knit, arched, turning neither in nor out. Seen from the rear, the hind legs are straight and parallel, but standing a bit wider than the forelegs. Stifles and hocks are moderately bent. Upper thigh: Muscles are dry and moderate developed. Lower thigh: The upper thighs and lower thighs are of the same length. Hind feet: Well-knit, arched, slightly narrower than forefeet. Easy, straightforward, fast. The dog’s silhouette is almost the same in movement as when it is static. HAIR: There exist two types of the breed: smooth-haired and longhaired. Smooth-haired: short, taut, shiny hair, without undercoat or bald patches. Longhaired: body is covered with moderately long (3-5 cm), flat or a bit wavy taut hair, which does not hide natural body contours. Hair on the head, on the front part of legs is short and taut. Distinct feathers on rear side of legs. All feet have long silky hair completely hiding toes. Ears are covered with thick and long hair forming a fringe. Adult dogs of more than three years have such a fringe, which completely hides the exterior edges and tips of the ears. Body hair should not look shaggy or too short (less than 2 cm). black and tan, brown and tan, blue and tan, also red of any shade with black or brown overlay, or without them. More rich shades are preferable for any color. Height at withers: 20 - 28 cm. - Level bite or alveolar slope of incisors. - Semi-drop ears. If long-haired dog has this fault because hair makes its ears heavier, it is allowed but not desirable. - Bald patches of short-haired dogs. - Too long or too short hair on body of long-haired dogs. - Small white spots on chest and toes. - Black, brown, blue, saddle, agouti color, smudged markings. - Height at withers is above 28 cm. - Overshot; undershot; absence of a fang. - Many bald patches of short-haired dogs. - Absence of decorative hair on ears and curly hair in longhaired dogs. - White color; white spots on the head, abdomen and above metacarpus; large white spots on chest and throat, brindled marks. - Height over 30 cm.